This spring Team THHN has a spring in its step like never before. We have SO much going on and with the longer days and the sunshine giving us all plenty of energy we’re firing on all cylinders. So, here’s a little review of what we’ve been up to, what we’ve got planned and what you simply must put in your diary. The idea is that you bake a cake or cakes and either sell them to raise money for us or eat them and make a small donation. Then, share a picture of your bake and nominate two other people to better your bake! They then bake and either sell them to raise money for us or eat them and make a small donation. Then, they share a picture and nominate two other people to better their bake and so it goes on…. Tag THHN in all your pics. Post them on Facebook, Twitter or e-mail them to us and, at the end of March, there will be a special prize for the best-looking bake. Please use the hashtag #BakeNominate on all social media posts! 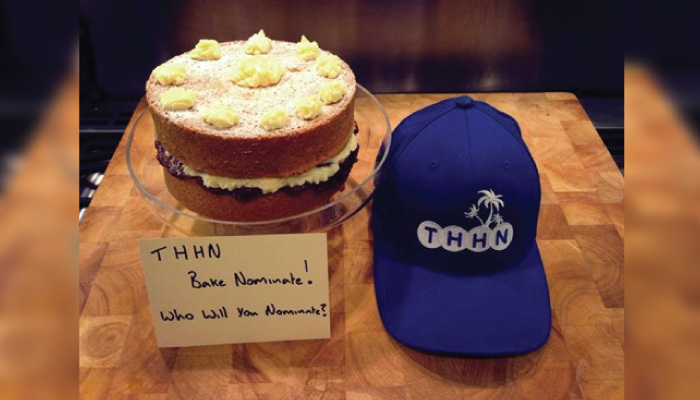 Text THHN00 £5 to 70070 to donate for the THHN #bakenominate challenge and make a difference today. You can change the amount if you wish to any amount. Obviously we’re not suggesting you completely ditch your slippers – you’ll need something to put on when you’re putting your feet up after a good run! Anyone who regularly reads our newsletters or follow us on Facebook or Twitter will be familiar with the amazing Glen Bevan. Glen has done many a crazy challenge to raise money for us over the past few years and guess what? He’s at it again. This May Glen will spend 4 days cycling 500 miles, swimming 1 mile, kayaking 2 miles, running a marathon and turning 40! Isn’t that what everyone does to celebrate their 40th birthday? To serious runners a half marathon does not sound too much like hard work. To everyone else it sounds like a Herculean task. So, how about a half marathon in bite-sized pieces done over 12 weeks? Beginning to sound a bit more manageable? Well, that’s just what our Half Marathon Schools Challenge is all about. The idea is that local schools encourage the children to run 1 mile each week over 12 weeks and then join the crowds on Paignton Green on Sunday, 28 June at the Torbay Half Marathon and run their final mile in front of hundreds of spectators using part of the traffic-free Torbay Half Marathon course. Each child taking part will receive a medal and a THHN t-shirt. Not only is the idea a great way to get children interested in running but if the children would like to raise sponsorship for THHN while taking part, then that would be even better. The school whose children raise the most money will win £100 of book vouchers. Each school will receive a map of the Torbay Half Marathon route so the children can mark off a section of the route after they have completed that week’s mile. For a bit of extra inspiration, each school can also receive a visit from Memory Maker Man, the THHN mascot, and THHN runners who will run one mile with the children at their school and tell them all about the charity and what they do. We have Team THHN charity places available on the Plymouth Half Marathon, this is a stunning route taking in some great views around Plymouth, we will have our gazebo on the Hoe on the day so you can meet up with the rest of the team, each runner will also receive our Team THHN runners T-shirt, all levels of runner welcome. Sign up today and become Memory Makers. If that’s not your thing then you still need to get the date in your diary and make sure you join us for a day of brilliant live entertainment and family fun on Babbacombe Downs. This spectacular location will feature all sorts of goings-on with a big entertainment marquee bringing you live music from midday until late. We’ll give you more details in due course but for now, save the date! Our fantastic charity shop in St Marychurch precinct goes from strength to strength. Open from Monday to Saturday from 9am to 5pm it’s packed with fantastic quality children’s clothes and toys as well as various THHN branded items. Pop in and say hello to the team. If you would like to spare a few hours and volunteer at the shop pop in and talk to Carolanne today, flexible hours available. All of our local suppliers and attractions. They are so supportive throughout the year and we started January by sending a family on a home from home holiday so that they could get out and about and enjoy all that this great area has to offer. Tom Chapman of Tom Chapman Hair Design who gave us a cheque for £168 after fundraising for us at the launch party of his new hair collection Th13teen, celebrating thirteen years in the hairdressing industry. Our great friends at John Lake Estate Agents who have entered a team to run our fabulous City to Sea 23 run – well done guys. Bob Vaughan – most people know Bob. He’s one of our most energetic and dedicated team members and has been hard at work over recent months organising an amazing Variety Show which took place at the Rainbow Hotel on Saturday 28 February. Thank you so much Bob for your tireless work – you are a ray of sunshine! Thanks as well to all the volunteers who helped out with this great event. Lyndsey Harper and Sue Ennals who ran an impressive 34.9 mile ultra marathon to raise money for us. Craig Fisher of Fish Bikes Torquay who has sponsored our new THHN cycle jerseys which are available to buy from our Memory Makers Shop in St Marychurch precinct. The Marine Hotel in Paignton who gave us a cheque for £1742.60 which they raised by running festive raffles for their guests over Christmas. Brian and Memory Maker Man were delighted to receive the cheque from Hotel Manager, Nicola Monkhouse, who also volunteers as one of our Holiday Liaison Officers. We have lots of great sponsorship opportunities available. We are fortunate enough to have great support from all sorts of people, groups, businesses etc and we are extremely grateful for that. This year we are particularly interested in anyone who would like to support our City to Sea event. This is going to be huge. To see how much PR this event has already generated just try putting “THHN City to Sea 53” into Google and you’ll see pages and pages of mentions, discussions and information. Groups are talking about it and word is spreading. This event is a great opportunity to not only support THHN and the work that we do but to get your name out there. We would love to team up with businesses for this event and have some terrific sponsorship opportunities on offer.